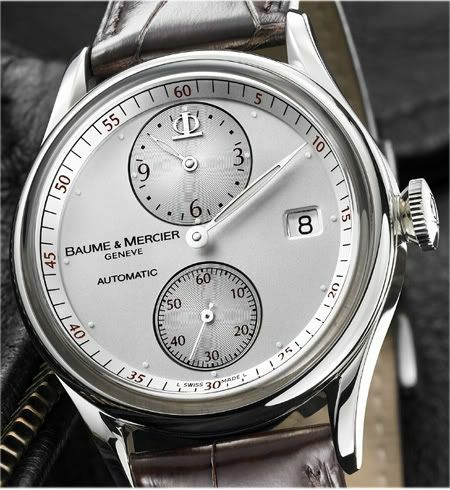 Finally, Baume et Mercier is back on the map (at least in my book). Their latest retro models are nicely done and will hopefully boost their image a bit. This Regulator (Regulateur) model breaths 1950s according to Baume et Mercier. A caliber 14070 Dubois-D?©praz based movement is ticking inside its 39mm stainless steel case. Price of this beauty is far from shocking, namely 1990 Euro (in Germany, it might vary worldwide). If you are into gold, Baume et Mercier also introduced a limited (176 pieces) Regulator with jumping hour, based on a caliber 14400 Dubois-D?©praz movement. The price of this one is a bit higher, 7200 Euro, but hey.. it’s gold! Both watches are water resistant up to 3 bar (30 meters) and come with an alligator strap. One slight note though… they should have left-out the date-feature. It ‘breaks’ the dial. So, B&M designers, remove the date window and re-position the printing to get it all ‘synced’.